We've all heard about them or seen them. You know, those odd little creatures with the conical hats found in gardens. Up to this point, I've never had the slightest desire to place a gnome anywhere near my home. But after reading Kaleb Nation's debut fantasy book, I just might change my mind. Maybe. It's a thought, anyway. Of course Bran Hambric: The Farfield Curse isn't completely about little gnomes. Actually it's mostly about an orphaned chap named Bran Hambric who struggles to figure out where he fits in a magical world gone awry. After a childhood of not knowing, he discovers the truth about his perplexing past, a past deeply entrenched in an evil sort of magic and a terrible secret curse. The book begins with a prologue. A six-year-old boy named Bran turns up inexplicably, locked in a bank vault in a city called Dunce--the only city in the world that does not allow magic of any sort. No gnomes, no mages. No magic. A banker named Sewey Wilomas discovers Bran in the vault and finds himself responsible for the boy due to a Finders Keepers Law. Bran ends up living with the very annoying Wilomas family, and they treat him like dirt. A ripped note stating his name and birth date is the only clue to his past. Fast forward eight years later. Bran still lives with the Wilomases and one fateful night finds himself face-to-face with a scary creature. He learns his mother was a powerful mage that used dark magic in horrific ways, discovers the reason for the torn note and determines the meaning behind a special crescent moon necklace. Along his journey of discovery he makes a few new mage friends and meets a gnome named Polland. Young author Kaleb Nation creatively depicts an exciting magical world in his suspenseful middle grade/YA fantasy. There's many obvious similarities between Bran Hambric and the beloved Harry Potter series--orphaned boy, magical world, an evil counterpart, unpleasant family life. But Nation has developed the city of Dunce and all the people and creatures inside and outside the city entirely from his own imagination. The scenes involving the Wilomas family in the beginning of the book bog down the story a bit, but the pace picks up when Bran learns more about magic and meets some mages and magical characters. Written using uncomplicated language, the book is sure to appeal to all those young readers that have been clamoring for Harry Potter read-a-likes. Nation makes readers chuckle with his over-the-top characters and even a few clever word plays, like measuring magical power in witts, calling those with the most, brightwitts and those with the least, dimwitts. Just so readers know, there are a number of slightly violent scenes involving guns, death and troubling dark magic in this book but nothing is especially graphic. The enticing artwork by Brandon Dorman on the cover is worth a mention and deserves a big thumbs up. The book leaves quite a few questions unanswered and Kalab Nation has plans for a sequel. I'm hoping to learn more about the gnomes and their sacred Givvyng Tree! As part of his homeschool education, Kaleb Nation started writing the book at the age of 14 and worked on it throughout his teenage years. Currently 20 years old, his young age makes this debut book an impressive accomplishment. Highly ambitious, Kalab Nation is also a successful blogger at his popular TwilightGuy.com website. Win a copy! 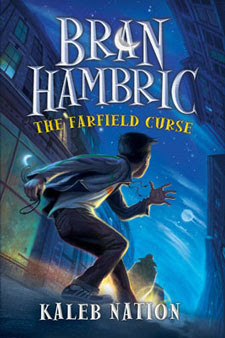 This review is part of the Bran Hambric blog tour, and Sourcebooks has kindly offered to give away a copy of Bran Hambric: The Farfield Curse to a Brimful Curiosities reader. To enter, leave a comment relevant to this post. Or, just for fun, if you are feeling particularly creative, think of an original gnome name and leave it in the comment section. • Contest ends on Monday, September 14th, 2009 at 11:59 PM CST. I love the name for the city of Dunce! Please enter me! Sounds like a great new magical world to explore. Gnomes are a newer twist, they seem to be less featured than elves and fairies. Please count me in! heard such great things about this book would love to win! Sounds like a delightful book. I'd love to read it. I would name a gnome Yreme Celexa. Interesting, I am in awe of people who are so creative in this way to create a new world with words! Seems like a book that my teenage daughter and I would enjoy reading. I'm kind of out of the loop on the new YA novels. I would be interested to read this. Jabbers Pavelwaldo! Cute name for a gnome! Kaleb Nation is so awesome! Did you know he made his own soundtrack for this book also? I can't wait till it comes out!! Count me in for this chance to win his book! Thanks for posting up this great review! I have gotten alot of great info from your blog! Thanks! An original gnome name, huh. Let's see... how about "Hans"? I follow you on twitter @trishalynn0708 and I retweeted. This sounds a bit like Harry Potter meets Artemis Fowl, and I loved both those series. This sounds like a great book to read with my children. As a librarian, I'm always on the lookout for new books. This one sounds like it will capture the reader's interest. I think my daughter would love to read this book. Please enter me in the giveaway. I believe this young writer has a lot going for him, and who knows? It may be fanrasy or..maybe...he knows the land of Dunce?? This sounds like a fantastic read. Please accept my entry, thanks! I would name a gnome Wiggy Tickletoes. Such amazing talent at such a young age - I can't wait to read this book. I love being able to escape into a fantasy world & become involved in all the new characters. I follow on Google Friend Connect & subscribe via Google Reader. Awesome! This is definitely going to be a great book! I follow Kaleb on Twitter and watch most of his BlogTVs! My two granddaughters would really enjoy this book. How about "Harlin" for a gnome name. If it is lame. Sorry not really in the business of naming gnomes over here. But I would love to get my hands on that book. I follow you on Twitter-CarolAnnM and I tweeted this giveaway. This looks like a great book. I think my tween would enjoy it. A great gnome name would be Crackalacka. That's her softball name. This looks like a great yound adult read! Hiya great review. I love gnomes, unfortunately I ran mine over - when someone blocked me in my driveway. I named him freddie, now he's got no feet. I tweeted about this and am now a follower. Thanks for the contest. My youngest would love to read this. I love gnomes; in Scandinavia they play significant roles in mythology and folklore. our oldest would love to win this book, he loves gnomes! My nephew would love this!!! A new name for a gnome? Hmmm...let me thing...how about Pizzastilksin??? Lol Thanks! Oh this book sounds really good. I love that the author started creating the story at 14, love that! Sounds like a great read for my kids. Make me a winner! this gnome would make all evil people turn into dust & send their souls straight to the devil. I subscribed to emails & to feed in reader & Follow on blogger! I adore Kalab Nation and am so excited to see his book out! My son would like this! I'm always looking for a new, interesting book for him to read!